I never buy cookbooks for the pictures, but I broke that rule a few months ago after previewing Tropical Asian Cooking. It’s nowhere near a vegan book, though there are several vegetarian or near-vegetarian recipes, but the photos were just so lovely that I had to have a copy. So I bought it and it sat for months by my reading chair with pieces of paper sticking out to mark potentially good recipes. But most of its dishes require more time and energy that I generally have, so none of them got made, until last night. Spinach Kofta caught my eye because it was easily veganizable by replacing the cheese with tofu and some seasoning, and the fat could be reduced by baking instead of frying. Unfortunately, I wasn’t sold on the eggplant sauce that accompanied the recipe, so after some thought, I decided to use a raita-style cucumber sauce instead. I will not lie to you: It was a lot of work for a week night. The list of ingredients looks simple, until you realize that the potatoes and the spinach need to be cooked before the rest of the recipe is put together. But all in all, it was worth it. The kofta, crispy on the outside and tender on the inside, were mildly seasoned, and even E., who didn’t want to try them at first, wound up cleaning her plate. And though they are seasoned with curry, I served them with pita bread and hummus, so consider them a cross-cultural kind of dish. Peel the potatoes, dice them into 1/2-inch pieces, place them in a saucepan, and cover them with water. Boil until the potatoes are tender and then drain them well and mash. Set aside. Bring a large pot of water to a boil. Add the spinach and blanch for one minute, or just until wilted. Drain well in a colander. Put the spinach along with the tofu, nutritional yeast, lemon juice and salt into a food processor and process until crumbly. Set aside. Spray a large skillet with canola oil and bring it to medium-high heat. Add the cumin seeds and toast for one minute. Add the onions, garlic, and ginger and sauté until the onions are soft, about 3 minutes. Add the garam masala, stir, and immediately add the potatoes and the spinach mixture. Cook, stirring, for 3 more minutes. Remove from the heat and spoon into a large bowl. Add the chickpea flour and stir well. Allow to cool until easy to handle. Shape into about 20 balls, approximately 1-inch in diameter. (Don’t worry about getting them perfect; they will naturally flatten out some during baking.) Place on an oiled cookie sheet or a silicone baking mat. Preheat oven to 450F. Bake for 10 minutes and then turn the kofta. Bake for 10 more minutes and turn again. Bake for 10 more minutes or until all sides are lightly browned. Serve with Cucumber-Soy Yogurt sauce (below), garnished with tomatoes, red onion, and hot chile peppers. 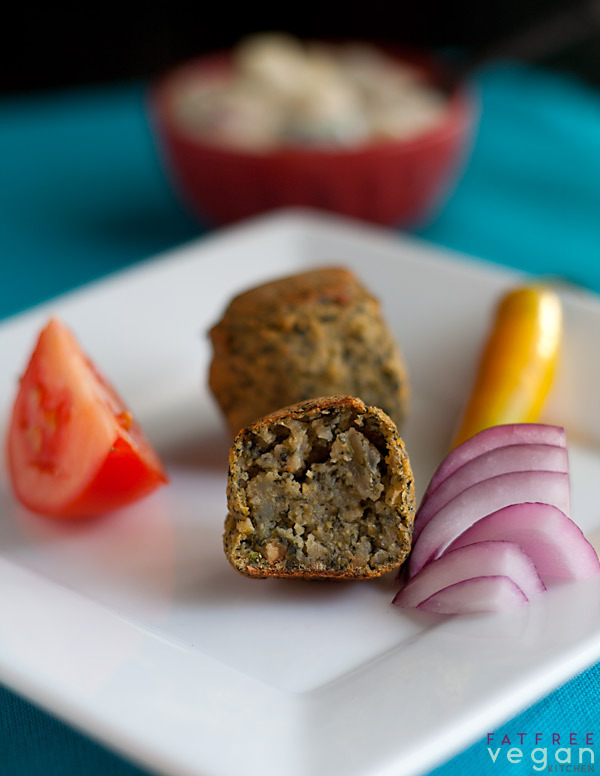 This makes a delicious stuffing for whole wheat pita bread or chapatis. Peel and finely dice the cucumber. Place the pieces in a colander and allow the liquid to drain while you mix the other ingredients in a bowl. Before adding the cucumber, blot it lightly with a paper towel to remove excess moisture. Add it to the yogurt mixture and stir to combine. Refrigerate for at least 1/2 hour to allow the flavors to blend. 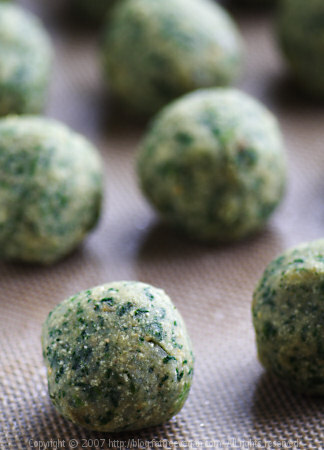 I made these last week and substituted frozen spinach for the fresh – it was all I had, but it worked fine. I defrosted it by putting it in a glass bowl and pouring boiling water over it, let it stand a few minutes, then drained in a colander and added immediately to my cooked mashed potatoes. It seemed to work fine. Also, I accidentally used a LOT more spinach than I should have – twice as much!! I mis-read the recipe. But the recipe seemed to work anyway; the balls were a bit soft coming out of the oven, but they tasted fine – a bit better the next day. Hi, Susan! I have been cooking your recipes for about 6 months now, and this one has inspired me to comment. It was amazing, and the balls were even better the next day, as the person above me said. Wow! Also, instead of soy yogurt for the sauce, I used tofu/unsweetened soymilk/lemon juice/garlic powder combined in the blender… then added all of your sauce ingredients. This was an amazing meal. Thanks so much– your recipes are much appreciated in my house… I can’t wait for your book to come out!! You have a couple more late but happy eaters at our house! We made these last week and loved them – the crisp golden shell is really quite impressive for something oven-baked in so little oil. Thanks Susan! Wow, that was fantastic. I just finished eating it in a pita with tomato and the sauce. The one thing is the instructions say cook for 30 minutes but I just did 20 minutes and it was moist and delicious. I would love to figure out a good side to go with this. This is a great recipe. I made it tonight for my kids. I had very little time to make dinner, so used 5 new potatoes that I nuked for five minutes, and frozen spinach that I nuked too. I had the whole thing done in about 45 minutes and the kids loved it too. I just made these and I love them. My son likes them but says he has to get used to the new flavor. I used a 1/2 tsp of cumin rather than the seeds. I didn’t have fresh ginger so I used 1/4 tsp of powder. 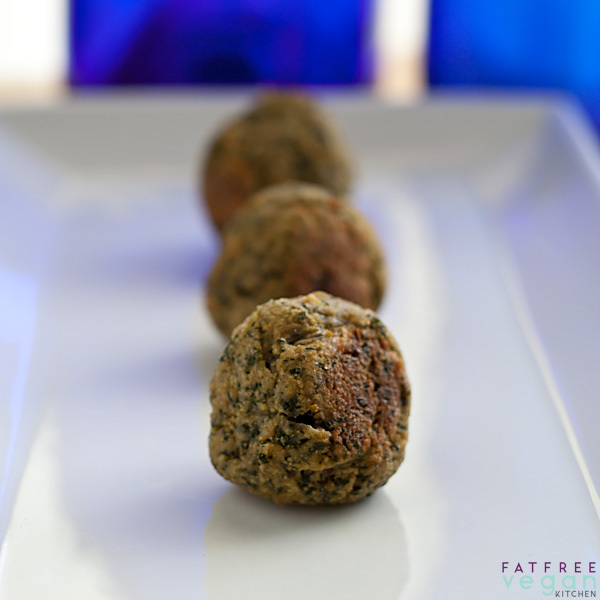 I also used less garam masala hoping that my son would enjoy it. I served it with chips and hummus. They taste good dunked in the hummus. I didn’t have sauce ingredients but they are fine by themselves. I just discovered this blog last month and I have thoroughly enjoyed it. I forgot to include to save time I used a small colander and dunked the spinach in the potato water. It gave it plenty of time to drain and saved a step. So yummy. uh oh, I must have done something wrong. My 'dough' is like very thick goopy batter….don't think it will ever form into balls. Maybe these will be baked kofta cakes. Same thing happened to me. I don’t know if she’s leaving some things out that we need to know or we’re just challenged but mine’s a mess. It tastes good but looks nothing like her pics and more like tasty, colorful mashed potatoes. I tried adding some wheat flour and letting is rest a bit to make things tighter but to no avail. I didn’t get any formed balls out of them so they’re kind of drop cookie kofta. They’re in the oven now so we’ll see what happens…. Um, “she” can hear you! How rude! Are you the same Sarah who just commented about the onion? I’m sorry, but if you missed that ingredient, it’s likely you’re the one who’s leaving things out, not me. The moisture content in potatoes and tofu varies, so it’s possible yours needed more flour. Once the proper consistency is reached, they will form into balls, as shown. thanx for ur all fatfree recipes. Hi – I just saw your recipe and I had to make it straight away. Found I did not have spinach, so I used half a cup of frozen green peas instead. I cooked this in the microwave first for 3 mins with 2 T of water and then drained it well. I did not have yeast flakes nor did have any basen. I did have some falafel mixture though. So I added 3 tsp of that instead. I just put all the kofta ingredients into a food processor and processed until it all bound together into a ball. The whole thing took only 10 minutes. I then rolled into balls, sprayed with cooking oil and just checked it into the oven like you instructed. Turned out very nice. 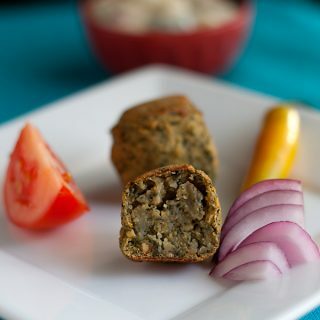 The direction say to soften onions for kofta but the ingredients for the kofta do not list any onions….? It’s the 8th ingredient, 1/2 onion, minced. My body doesn’t tend to agree with soy, what could I subsitute for the tofu?? The recipe sounds delicious! Delicious! I’m going to freeze part of the batch so that I can enjoy them another time soon. My holidays are over tomorrow and I won’t have any time to try new recipes. What a shame! I really like your compilation of favorite 2010 recipes, and although I’ve tried most of them, I have never made the burgers or the breakfast cake, and after all the praise I feel eager to give them a try. Easter is my deadline. Do you think you and Kara could make this recipe tomorrow morning in time to get here about 11:30? I can do the yogurt sauce – or you can come over here and make it. wow, oh my gosh! definitely my favorite so far! you HAVE to have them with the sauce because it is truly an amazing experience. thank you so so so much! i’ve definitely thought of ways of making the recipe not take as long (nuking potatoes, etc.) because it seemed to take forever for me. i honestly can not wait to make this again. one thing i really liked was leaving the potatoes a little bit chunky. they complimented everything else so well! I made this tonight (along with Susan’s Eggplant & Chickpea Curry) to bring to an Indian potluck tomorrow. I whipped up the potatoes in the food processor, which I think was a misstep. They were stiff and kind of tough, and that’s my fault for being too lazy to mash by hand. Next time, I will not be so lazy and I will mash the potatoes by hand. I also used a frozen block of spinach, which I drained well in a wire sieve. My batter was kind of wet, but by keeping my hands wet with water (the way you do when you’re rolling sushi nori) most of the batter stayed off my hands. It dried nicely in the oven and the kofta were delicious. Thanks, Susan. Hi Susan. Do you know if these can be made a day ahead, and then cooked right before serving?? I am planning a big party and have to prep foods the night before as much as possible…. Hi Susan, I are vegan kofta in a spicy tomato sauce at a restaurant tonight and want to try to replicate the recipe without deep frying. Do you think this version would work? (Maybe I shouldn’t add them to the sauce before serving, so they don’t get soggy…) I haven’t tried this recipe, so please share your thoughts. And thanks! I love your site.